The nuclear reactors are not the major concern - rather it is the nuclear fuel. Today’s nuclear reactors use uranium fuel with an enhanced concentration, or enrichment, of the active isotope of uranium U-235. 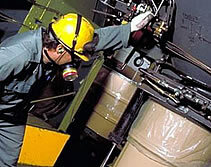 The process of enriching uranium for nuclear fuel uses precisely the same equipment as could be used to produce the much higher concentrations needed for a nuclear bomb. As the fuel is burned in a reactor, plutonium is formed. If the nuclear waste is reprocessed, the plutonium is extracted and it can also be used to power a nuclear bomb.